Your day-by-day itinerary now includes Paphos Harbour Castle, Saranta Kolones Castle and Savvas Pottery. You'll explore the less-touristy side of things at House of Dionysos and Church of Agia Kyriaki and post St. Paul. Your inner history buff will appreciate Tombs of the Kings and Panagia Chrysopolitissa Church. There's lots more to do: explore the ancient world of Kato Paphos Archaeological Park, stop by Kivotos Gallery, see the interesting displays at The Grivas Monument and Museum, and enjoy the sand and surf at Coral Bay. To find photos, more things to do, ratings, and more tourist information, refer to the Paphos online day trip planner . Athens, Greece to Paphos is an approximately 5.5-hour flight. You can also do a combination of flight and bus; or do a combination of bus and ferry. In March, plan for daily highs up to 22°C, and evening lows to 11°C. Finish your sightseeing early on the 7th (Wed) so you can drive to Polis. 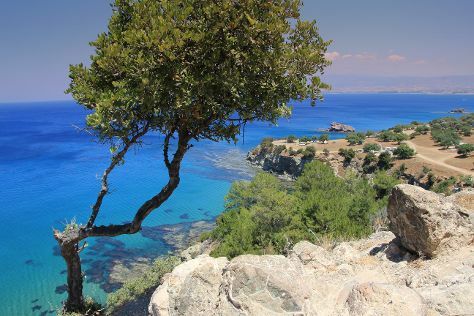 On the 7th (Wed), delve into the distant past at Agia Ekaterini, see the interesting displays at Fyti Weaving Museum, and then hike along Adonis Nature Trail. On the 8th (Thu), you'll have a packed day of sightseeing: contemplate in the serene atmosphere at Agios Ioannis Lambadistis Monastery. Planning Polis trip won't be overwheling when you use's Insprock itinerary maker. Drive from Paphos to Polis in an hour. Alternatively, you can take a bus. March in Polis sees daily highs of 22°C and lows of 11°C at night. Wrap up your sightseeing by early afternoon on the 9th (Fri) to allow time for the car ride to Latchi. Start off your visit on the 9th (Fri): take in the dramatic natural features at Baths of Aphrodite and then identify plant and animal life at Akamas Peninsula National Park. Here are some ideas for day two: contemplate the long history of Church of St. Rafael and then kick back and relax at Aphrodite's Beach. To see reviews, ratings, maps, and more tourist information, use the Latchi vacation builder website . Latchi is just a stone's throw from Polis. In March, daytime highs in Latchi are 22°C, while nighttime lows are 11°C. Wrap up your sightseeing on the 11th (Sun) to allow time to drive to Kouklia. Visit Kouklia and explore a world where legends, history, and traditions come together in a picturesque natural environment. Kick off your visit on the 11th (Sun): delve into the distant past at Palea Enklistra, stop by Achilleas Jewellery, then don't miss a visit to Kouklia Arts Centre, then take in the dramatic natural features at Aphrodite's Rock, and finally play a few rounds at Aphrodite Hills Golf Course. 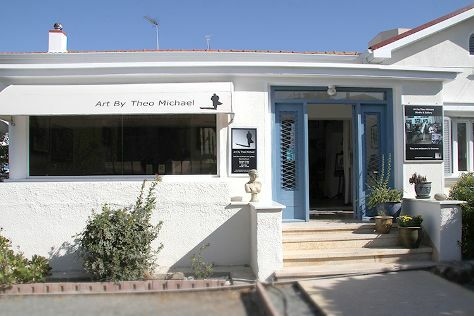 Here are some ideas for day two: examine the collection at Carob Museum and Factory - Mavros Chrysos, then contemplate the long history of Monastery of Timiou Stavrou, and then view the masterpieces at Barefoot Designs Art Gallery. Inspirock's itinerary builder makes planning a Kouklia trip simple and quick. You can drive from Latchi to Kouklia in an hour. Another option is to take a bus. In March, plan for daily highs up to 22°C, and evening lows to 11°C. Wrap up your sightseeing by early afternoon on the 13th (Tue) to allow enough time to drive to Limassol. On the 13th (Tue), take in the spiritual surroundings of Agios Nikolaos tis Stegis Church, then buy something for everyone on your list at MY MALL Limassol, and then see some colorful creatures with a scuba or snorkeling tour. Keep things going the next day: examine the collection at Oleastro Olive Park and Museum and then take in the architecture and atmosphere at Timios Stavros Monastery. To see more things to do, other places to visit, photos, and other tourist information, refer to the Limassol trip itinerary builder website . Drive from Kouklia to Limassol in an hour. Alternatively, you can take a bus. In March, plan for daily highs up to 22°C, and evening lows to 12°C. Wrap up your sightseeing on the 15th (Thu) to allow time to drive to Tochni. Tochni is a village located in the Larnaca District of Cyprus, about halfway between the cities of Larnaca and Limassol. Kick off your visit on the 15th (Thu): do a tasting at Ktima Dafermou Winery, then take in the spiritual surroundings of Stavrovouni Monastery, then admire the masterpieces at Traditional house, and finally explore the ancient world of Choirokoitia Neolithic Settlement. To find more things to do, traveler tips, and other tourist information, read Tochni trip planner . Tochni is just a short distance from Limassol. March in Tochni sees daily highs of 23°C and lows of 10°C at night. Finish your sightseeing early on the 15th (Thu) to allow enough time to drive to Nicosia. Start off your visit on the 16th (Fri): get engrossed in the history at Cyprus Museum, make a trip to Ledra Street Crossing Point, and then take in the architecture and atmosphere at St. John Cathedral. To find ratings, reviews, maps, and more tourist information, you can read our Nicosia tour itinerary app . Drive from Tochni to Nicosia in an hour. Alternatively, you can take a bus. In March in Nicosia, expect temperatures between 23°C during the day and 9°C at night. Finish your sightseeing early on the 16th (Fri) so you can drive to Protaras. 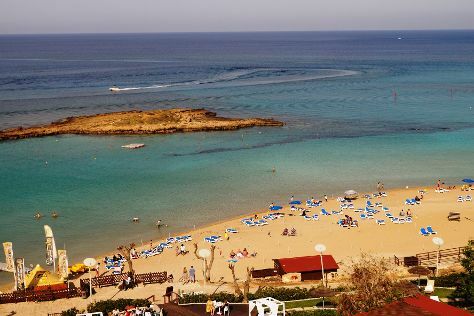 Kick off your visit on the 17th (Sat): take in the spiritual surroundings of St Barnabas Monastery and Icon Museum and then enjoy the sand and surf at Fig Tree Bay. On the 18th (Sun), you'll have a packed day of sightseeing: trek along Profitis Elias - Konnos Nature Trail, then take in the architecture and atmosphere at Church of Profitis Elias, and then get outside with Cape Greco (Cavo Greco). For more things to do, other places to visit, photos, and tourist information, you can read our Protaras sightseeing planning tool . Traveling by car from Nicosia to Protaras takes 1.5 hours. Alternatively, you can take a bus. Expect a daytime high around 23°C in March, and nighttime lows around 10°C. Finish up your sightseeing early on the 18th (Sun) so you can go by car to Ayia Napa. You'll discover tucked-away gems like Salamis Ancient City and Pantachou Beach. Outdoor Folk Art Museum For Traditional Crafts and Othello Castle are good opportunities to explore the local culture. Go for a jaunt from Ayia Napa to Famagusta to see Sea Gate about 50 minutes away. The adventure continues: look for gifts at Taste of Life, examine the collection at Thalassa Municipal Museum, take in the spiritual surroundings of Ayia Thekla Chapel, and pause for some serene contemplation at Agios Georgios Church. To find maps, more things to do, other places to visit, and tourist information, use the Ayia Napa vacation app . Ayia Napa is just a short distance from Protaras. In March in Ayia Napa, expect temperatures between 23°C during the day and 10°C at night. Finish your sightseeing early on the 21st (Wed) to allow enough time to drive to Larnaka City. Larnaka Tourism Board - Free Winter Experiences has been added to your itinerary. Here are some ideas for day two: pause for some serene contemplation at Saint Lazarus Church and then take a memorable tour with Larnaka Tourism Board - Free Winter Experiences. For maps, reviews, photos, and other tourist information, go to the Larnaka City online itinerary builder . Getting from Ayia Napa to Larnaka City by car takes about an hour. Other options: take a bus. In March, daytime highs in Larnaka City are 23°C, while nighttime lows are 10°C. Finish your sightseeing early on the 23rd (Fri) to allow enough time to travel back home.